I've had this pillow on my 'ideas list' for a while now. It's going to be another Christmas gift using up my scrap fabrics! This pillow is for Thom and will go towards his Christmas presents and I have taken the inspiration for this from his cloud singlet I made earlier this year. If you would like to try making one I've written up some basic instructions below - I'd love to hear from you if you try it out too so make sure you post a comment, or any questions you have! 1. 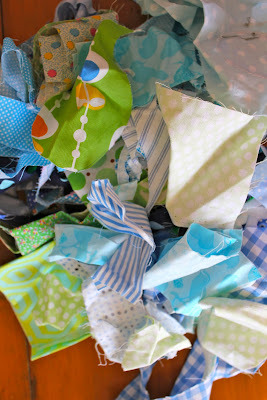 Gather together a variety of different blue and green fabrics. Mine have all come from the scrap basket. 2. Trace out your cloud image onto the wadding and cut out. Sorry my image isn't very clear. 3. Lay out all your fabrics across the cloud until you are happy with this colours. 4. Start sewing the strips together straight onto the wadding. Iron each strip as you sew it to ensure it sits flat. 5. Trim back the excess fabric back to the cloud image. I then machine quilted the strips with random vertical lines to give it a little more texture. 6. To piece the pillow together lay the cloud top face down onto the backing fabric and pin. Once it's pinned down you can cut the backing out. Then sew around the cloud - I used a 1/4 seam. Make sure you leave a gap at the bottom on the pillow about 8cm wide to stuff the pillow. 7. Before you turn the pillow through you will need to clip the seams. This will make the curves of the cloud sit neater. 8. Turn the pillow through and stuff with the toy stuffing. Stitch shut the the open seam with a slip stitch and you are done!